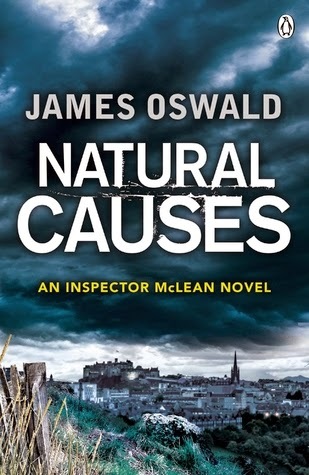 James Oswald's Inspector McLean books have been cropping up regularly on my radar for a good while now, but as a crime agnostic I'd never felt particularly inclined to read them. I was, however, encouraged when this one made the Richard and Judy bookclub list last summer which can be a bit hit and miss for my tastes but is usually an encouraging sign. R&J bookclub picks usually score well for readability. Which is what I think about this one. It's readable...eventually. It took me 20% to start caring and 40-45% to get properly hooked (which is an achievement, hooking me usually means 4 stars). Natural Causes presents itself as a crime novel and this is a problem. It is a crime novel, but it's something else as well: a supernatural thriller. I was aware of this second genre before I read the book and the reason I've put it in spoiler tags is because it massively, massively derailed an awful lot of the book for me. There were many instances where I'd nod to myself thinking "Ah, I see what you are doing here", only for it to come to nothing (although I suspect these things may Be Important in later books in the series). There are also plenty of other smallish things which don't really pertain to the plot of this book - like McLean's inheritance - which leaves it feeling flabby and loose where it needs to be tight and confident. Rather like myself. The second problem with this Other Genre is that there's not enough of it. Only in the final throws of the novel do we get a commitment and by that point there's not enough time or context to make it work properly. The final conversation between McLean and his boss about the case is almost comically bizarre. "So, Tony, It turns out to have been a demon from beyond the pits of hell, does it?" "Well, I expect you've got a lot of paperwork to be catching up on." It's a difficult one because if the book *had* shown its hand earlier, it would have changed a lot about it and I suspect it may have ended up being either derivative or ridiculous. Then again, it may have helped to give it more of an identity. I can't think of many books I've felt this divided over: it manages to be readable (eventually) yet broken in a fairly fundamental way. It's also fairly relentless at times. There are an awful lot of dead bodies, more than 10, not all victims and not all in the case McLean is investigating. At one point, I thought I was going to need a diagram to help me remember which bodies went with which case, let alone which cases McLean was supposed to be investigating and which ones he was merely involving himself with. The first half is also rather repetitive with regards to McLean being knackered. If the poor bloke had just been able to go off duty and not have somebody die, or not ruminate on somebody who had died at some point in the past, matters would have been improved immensely. Allowing it to effect the plot would have been even better. Instead, there's just an endless series of conversations about the sleep McLean should be getting but isn't. I also spent far too much time as a reader ahead of him. Far too often, McLean realised something he should have put together earlier, or else remembered something only at that moment. The book didn't progress due to his actions enough. However, for all the flaws, this was a very readable book. I'm giving it 3 stars, which is 2 stars for the confusing plot - which despite have eighty bajillion different cases, everything turned out to wrap up with case McLean cared about the most: the dead girl - and 3.5 for being engaging. I'm interested in reading other books in the series, but either as a Library book or a cheaply priced one. I'm tempted to skip ahead to books 3 or 4 in the hope they are tighter in their plotting (Books 1 and 2 were originally self-published).